I’m so excited to announce a brand new item from Homeschool Story! Have you wished you knew more scripture? Do you want to teach God’s Word to your children? Would you like a simple way to memorize the Bible? 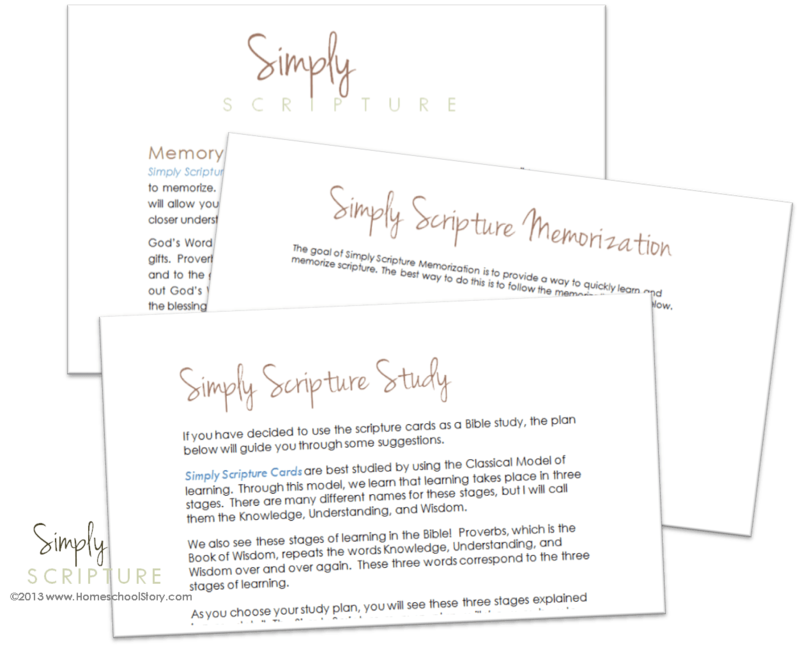 The Simply Scripture system is a collection of cards that contain Bible memory verses. The cards are organized in sets (or themes). Our first set is called Promises of Psalms and Proverbs! These scriptures have been chosen because they contain amazing Biblical promises. Also available is a free ebook that explains how the Simply Scripture system works. You can learn how to use the cards in an easy to use memory system, or you can learn how to use the scripture cards as a Bible Study for you and your family! The cards are available in pdf download or you can order them already printed and laminated. To order these cards, or to download the ebook, please visit my online store NOW. Will there be 3 sets like the 3 cycles of cc? I would love to get a set, I have a semi-homemade one, but not on promises, and we need that roght now! Thanks so much! Do you want the laminated ones? I was just heading out the door on my way to a meeting…with your cards in hand! Do you want me to wait and add the scripture cards too? I can get them printed and then mail them both tomorrow. You can pay for them at http://www.homeschoolstory.contentshelf.com. I’m leaving in about 10 min. so if I don’t hear from you, I’ll just mail the other cards since I know you’re waiting on those! What version of the Bible was used in making these? Thanks! Hello Cheri, great question. I used New King James for these verses.